A set of new shark-themed stamps including species of global conservation concern could make your next trip to a post office somewhat exciting—if you live in Canada, that is. Five shark species that inhabit Canadian waters are highlighted in Canada Post’s latest set of stamps. From the enormous basking sharks to the elusive, long-lived Greenland shark, they encompass an impressive swath of biodiversity, doing justice to a country whose thousands of miles of coastline include 28 species of sharks. 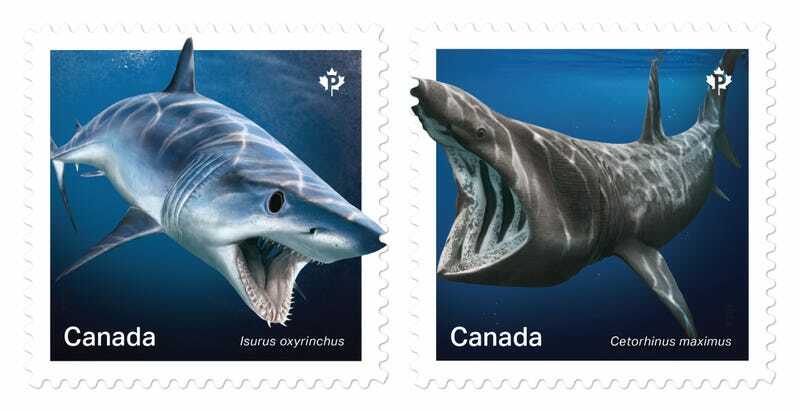 The US postal service issued their own set of shark stamps last year, but honestly, Canada wins this round. The stamps pay homage to conservation issues by highlighting species under threat. Basking sharks, for instance, were the first marine fish species listed under Canada’s Species at Risk Act—populations declined precipitously after they were targeted as pests. Some of the others species are overfished. Shark enthusiasts are appreciative of the realistic detail, anatomical and ecological accuracy of the stamps, which is thanks to the careful eye of scientific illustrator Julius T. Csotonyi and his team. “This highly visible project is yet another great opportunity for conservation and educational outreach to the public about a group of organisms that very much need our help in this age of a heavy human ecological footprint,” Csotonyi told Earther. Dr. David Shiffman is a Liber Ero Postdoctoral Research Fellow studying sustainable shark fisheries in Canada. You can follow him on twitter @WhySharksMatter, where he’s always happy to answer your questions about sharks. Can the US Government Help Save the Fastest Shark?